The 66th Annual Meeting of the Ecological Society of Japan (ESJ66) will be hosted by the Organizing Committee and the Annual Meeting Planning Committee. Details are as follows. Registration to participate and applications for giving presentations will be accepted from early October. Please check the latest information at Official ESJ66 website. Please note there have been many changes of ESJ66 participants and presentations. The main changes are: 1) reorganized types of sessions (removed “organized session”), 2) charging for participation in the workshops, 3) Japanese and English written together for names and titles in presentations, and 4) removed ability to upload presentation files beforehand (data will be copied from USB flash memory at the venue), and 5) the organization and presentation of symposiums and workshops by the member of The Molecular Biology Society of Japan (MBSJ). Please check below for details. Symposiums and workshops will continue with the small changes as below. About 3 hours Invited speakers are welcomed and their registration fee may be waived (including speakers invited by the journal Ecological Research; ER symposium). About 1.5 hours Workshops are considered as an official function of the ESJ66 meeting (presentations with a registered abstract are considered official presentations). Opinion exchanges or lightning talks without abstracts are also acceptable. Please check Session Proposals for details. Organizers are required to register their own meetings with all information about presentations. Presenters and organizers who are not currently ESJ members must join ESJ before submission of proposals for presentations and meetings. The deadline for membership application is 11:59 p.m. (JST), Wednesday, October 31, 2018. We request that participants pay their membership fee by Friday, March 8, 2019, so we can confirm payment before ESJ66. Name tags, presentation titles, and authors’ names in the program and abstract books, and other materials, for all Japanese presentations are shown in both English and Japanese. Speakers who present in Japanese are still required to register such information in both languages. Presentation files are submitted by data copy from USB flash memory at the venue, not by prior upload. Please bring your presentation file on a USB flash memory and copy it to the computer in the speaker ready room before your presentation at ESJ66. Check Preparing Oral Presentations for details. According to the partnership between ESJ and MBSJ, all MBSJ member can organize symposiums and workshops, and be a speaker in these sessions as invited speaker. Please use login IDs for guest speakers to register your sessions or presentations via the online registration system. Please send your questions and other inquiries on any subject via the inquiry form. The schedule is subject to change based on the number of proposals. Please refer to the official website for the latest schedule. After applying for your membership via the website, the ESJ Member Service Desk will notify you of your temporary member number. Please use the number for proposals of presentations and meetings. Membership application is accepted at any time for participants not giving presentations. However, participants who wish to apply for sessions are required to first apply for membership. Please note the deadline is 11:59 p.m. [JST], Wednesday, October 31, 2018. We recommend participants complete payment of the membership fee by Friday, March 8, 2019, so the organizing committee can confirm your payment before the start of ESJ66. Please show your payment receipt at the venue for confirmation if you pay after March 8. Please bring your presentation file on a USB flash memory device by the day of your presentation. For details, please see Preparing Oral Presentations. Schedule is subject to change. Please check the latest schedule on the official website. We will not respond to inquiries after 5 p.m. (JST) on each deadline day. Your early confirmation of the procedures would be appreciated. No changes and additions will be accepted after the deadlines. Admission (including re-admission) to the society from 2019 is mandatory for giving presentations at ESJ66. Please apply for an ESJ membership and pay the membership fee by the date of the ESJ66 meeting. For current members, each payment for the 2018 membership is required in order to give a presentation at ESJ66. Please aim to complete payment by Friday, March 8, 2018. In the case of later payment, please show your payment receipt at the venue for confirmation. Admission cannot be canceled, and we do not refund membership fees. The early registration fee is applicable to those who complete payment by each due date. Please pay via the online payment system (the website will be accessible at early October). The participation fee is not charged for undergraduate and high school students as audience members (including non-ESJ members). Please show your student ID card at the on-site reception area (No need for advance online registration). Early registration is recommended because capacity is limited. Student rates will be applied for the participation and banquet fees for young members without regular income. Temporary member (applying for the membership) for whom this applies should state so at registration. The banquet is to facilitate communications among researchers in a relaxed atmosphere. it provides valuable opportunities, especially for young researchers, to meet other scientists and acquire new research-related relationships. To this end, we set fees as low as possible for student attendees and ask for a higher fee for non-student attendees. We appreciate your understanding and participation. You may cancel your registration and banquet participation at no charge by Thursday January 31 and Friday February 8, 2019, respectively. No refunds will be given after these dates. Note the standard processing period for visa applications is 5 working days. The ESJ office will provide necessary support for documents needed from Japan. If you require a letter of invitation to support your visa application, you must first register to attend the ESJ66. Once you receive your registration confirmation email, please email your request to the ESJ office (office@mail.esj.ne.jp) for a letter of invitation. The ESJ office will only issue the documents, “Reasons for Invitation” and “Itinerary,” for participants who must apply for a visa. For inquiries and assistance, please contact the ESJ office (office@mail.esj.ne.jp). Presenters and organizers should register their sessions or presentations via the online registration system (to be available at early October). Please check the latest updated information on the website. Please carefully read Session Proposals and Oral and Poster Sessions for details on application procedures for symposiums, workshops, and oral/poster presentations. Please note that any changes and additions incurred because of incorrect input and/or illegible characters will not be accepted after the deadline. The qualifications for, non-members, and MBSJ members are as follows. Qualifications for non-members are limited. We hope you will join the ESJ on this occasion. To limit duplicate presentations, see the details below on sessions and contributed presentations. 1For presenters of presentations. Co-authors need not necessarily be ESJ members. 2ESJ membership or MBSJ membership is required for all organizers. 3Commentators without abstract registration. As commentators with registered abstracts should follow the same qualification rules as presenters, ESJ membership is required by Wednesday, October 31, 2018. 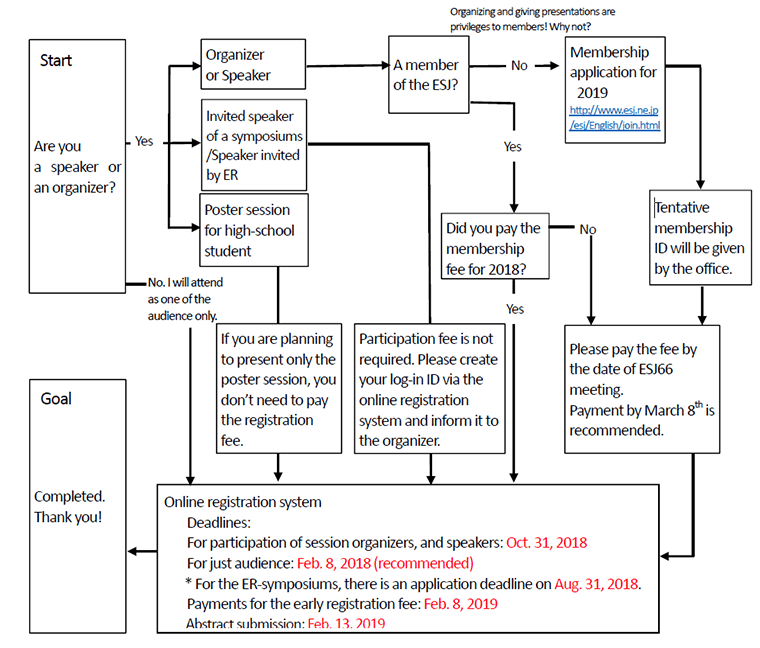 Those who are currently not ESJ members, but intend to be presenters and/or organizers (except for invited speakers), should apply for 2019 membership by the date of ESJ66. This deadline also applies to those who wish to rejoin the ESJ after having failed to pay membership fee in previous years. Non-ESJ members can pay the participation fee to join the meeting as an audience member. Please apply for participation and make payment via the online registration system (to be available at early October). On-site application is also accepted. Workshops are categorized as official events and a participation fee will be charged even for audience members who only attend workshops. Workshop tickets (1,000 yen) are available on-site. The participation fee is not charged for undergraduate and younger (junior high school and high school) students if they attend as audience members (there is no need for advance online registration; please come to the reception desk at the meeting and show your student ID). The participation fee is also not charged for presentations by high school students. However, an application and payment of the participation fee is required for students planning to give a presentation in other sessions, such as oral or poster presentations. If you are planning to participate as one of the audience of workshops only, neither registration nor application is necessary. Please pay for a ticket (1,000 yen) on the day of the conference. If you are a speaker of a forum, the application is not necessary. Any registrations are not required if you do not attend any other sessions or presentations. Non-member speakers (invited: included invited by the Ecological Research (ER)) are required to entry your participation to the banquet. Only the speakers invited by ER are free of charge. To avoid congestion at the reception area, participants in Japan who have completed their payment by Friday, February 8, 2019, will have their name tag mailed to their registered address. Please bring the tag to the meeting venue and wear it while you are there. Participants from abroad can pick up their name tags at the reception area. Please stop by the reception area if you forget your name tag. Contact us via the inquiry form on the website if you do not receive your name tag by Friday, March 8, 2019. A program book (electronic version) will be available on the official website from around January 2019. An exchange ticket for the program book will be sent to participants who have paid their participation fees by Friday, February 8, 2019, to the registered address (only valid for addresses in Japan). Please show the ticket to receive the book at the venue. Participants whose registered address is not in Japan can receive the ticket at the reception area. Please stop by the reception area if you forget your ticket. Please contact us via the inquiry form if you do not receive your ticket by Friday, March 8, 2019. Participants can purchase the program book for 500 yen at the on-site registration. The abstract book will not be printed or edited as a PDF file. Only an HTML version will be available from February 2019 on the official website. All abstracts, including those of previous meetings are available on the official ESJ website in compressed ZIP file format. Unzip the file to browse and search for schedules, presenters, and keywords. Sessions are incorporated into symposiums, workshops, and forums from ESJ66. Contents and application requirements for symposiums and workshops are changed, please carefully confirm the following explanations and register. Proposals for symposiums and workshops must be submitted by 11:59 p.m. (JST) on Wednesday, October 31, 2018. The registered contents will be used for the program book and abstract book. No changes and additions to proposals will be accepted after the deadline. Organizers, co-organizers, and all speakers should register as participants before submitting proposals for sessions. We would appreciate your taking care of this matter as early as possible. Membership IDs can be found in the membership search functions on “My page” in the registration system. Please register via the registration system. There was an earlier deadline (already closed August 31, 2018) for organizers inviting guest speakers invited by Ecological Research (ER). Organizers must register all information relevant to the presentation. The organizer should prepare the presentation information (title, speakers’ names, and affiliations) and the membership IDs of organizers (login IDs for guest speakers). Please register the title of the symposium, abstract (within 200 words in English) and presentation information. Note that all speakers’ registered information will be set in this format. No proposal changes will be accepted after registration. Symposium speakers are limited to ESJ members who have applied for membership by Wednesday, October 31, 2018, and completed payment before the opening of ESJ66 (except for guest speakers including MBSJ members). Please pay the registration fee via the registration page, unless you are a guest speaker. Please inform the organizers of your presentation information (title [within 150 characters in English], name, and affiliation of speakers and co-authors) and the membership IDs of speakers (login IDs for guest speakers) before the deadline. Register the abstract (within 200 words in English) by Wednesday, February 13, 2019. From this meeting, workshops have become official events. Registration of abstracts is applicable. Presentations with no abstracts (e.g., expressing opinions and discussions) will also be accepted, as before. There is no need to register presentations for these. Only the abstracts of workshops will be published in the program book. The organizer should prepare each presentation’s information (title, speakers’ names, and affiliations) and the membership IDs of the organizers, co-organizers, and speakers. However, there is no need to register the membership IDs of speakers who will express their opinions and comments without abstract registration. Please register the title of the workshop, abstract (within 200 words in English), and each presentation’s information. Note that speakers’ registered information will be set in this format. No proposal changes will be accepted after registration. Presentations with no abstracts (e.g., expressing opinions and comments) are not official presentations. Please do not register the speakers and introduce them in the workshop abstract. Workshop speakers are limited to ESJ members who have applied for membership by Wednesday, October 31, 2018, and completed payment before the opening of ESJ66. Non-ESJ members are not allowed to be invited speakers (presentations with no abstracts [e.g., expressing opinions and comments] are acceptable). MBSJ member can be allowed to be invited speaker according to the partnership between ESJ and MBSJ. Please pay the registration fee via the registration page. Overviews, comments, and opinions without submission of an abstract will not be counted as presentations; therefore, they are not subject to limitation for duplicate presentations. However, please note it is not possible to adjust their schedule to eliminate overlap with symposiums. Please register the abstract (within 200 words in English) by Wednesday, February 13, 2019. From this meeting, workshops will become official events. Registration of abstracts is applicable. Differences between symposiums and workshops are outlined below. Forums are organized by the Committee of the ESJ and are aimed at inviting opinions on ecology-related issues. The ESJ addresses, promotes, and shares information among ESJ members and develops agreement within the ESJ via widespread discussion. Organizing and providing topics are exempted from the “one presentation rule.” Representatives of each committee can register for forums. ESJ members are invited to give a presentation during either oral or poster sessions. Choose your preferred presentation type (oral or poster) when applying for a presentation. Owing to limited space and time, we may, however, ask you to change your presentation type. We hope that oral or poster presentations in English improve scientific communication with participants who are less proficient in Japanese. Oral presentations can be given in English either at Japanese or English oral sessions. The English sessions will include presentations entered for the English Presentation Award. We also encourage speakers in Japanese to include English along with Japanese, even if only in some parts of their presentation files and/or posters, to improve scientific communication with participants who are less proficient in Japanese. When applying for a presentation, please choose sections from the below list. This will allow us to assign rooms and times for oral presentations and allot poster presentations appropriately by topic. Please indicate your preference (in order from first to third) from the section list in the registration form in the online system. The planning committee will integrate English oral sections in accordance with the numbers of presentations in each section. A speaker (or the main contributor at the oral or poster session) from each presentation must be an ESJ member. Co-authors need not be ESJ members. Speakers should register their presentation and complete payment via the online registration system by the deadline. Speakers should provide presentation titles (within 150 characters in English) and author names when applying for a presentation. Speakers should submit an abstract (within 200 words in English) via the online registration system by the deadline (February 13, 2019). Each ESJ member is allowed to serve as the presenter for only one oral or poster presentation (but can co-present more than one). Organizers and symposium speakers cannot give oral and poster presentations. These restrictions are imposed in order to equitably share limited resources (space and time). Prior submission of presentation files via an online system has been discontinued. Please submit your file in the speaker ready room during the meeting. Oral presentations are given via the PC (Windows OS) equipped in the speaker ready room. Use of your own PC is not permitted. The presentation file should be prepared in Microsoft PowerPoint or PDF format not exceeding 20 MB in file size. Speakers should save a presentation file on their own USB memory, bring it to the speaker ready room, and copy it to the PC equipped in the room by 12:00 on the presentation day. Presentations that are not copied to the PC by that time will be cancelled. Details on file submission will be given on the official website. We will provide a 90-cm-wide × 210-cm-high poster board for each poster presentation. Poster sessions will be conducted for 2 days during the meeting. We expect to receive about 1,000 submissions. We may ask you to change to an oral presentation if the applications for poster presentations exceed capacity. Please bring thumb tacks pins to attach your poster to the poster board. Below are the criteria used to select outstanding posters. Please prepare your poster with reference to these points. In a poster presentation, it is important to illustrate the contents of your research concisely. The following features are required: 1) precise title, 2) simple abstract, 3) efforts to draw attention, 4) efforts to convey the outline. Figures and tables should be easy to read from a distance and overloading with information should be avoided. A comprehensive outline without need for explanation is another important consideration. 1) Originality and innovativeness, 2) quality and quantity of data, 3) validity of analyzing methods, 4) validity of discussion and conclusion, will be evaluated. The 6th English Presentation Award (EPA) will be part of ESJ66. Please see the website for more details. We appreciate your sharing this information with those who are potentially interested in the EPA. The EPA aims to promote English presentations in ESJ annual meetings and to give all participants more opportunities to share scientific ideas with international students and visiting researchers in Japan. At the same time, the EPA working group gives students and early career members an opportunity to gain experience in scientific communication, particularly experience that will be useful in international meetings. All presentations will be scored and the EPA working group will award outstanding presenters. Eligibility is limited to ESJ members who are students (undergraduate, graduate, and PhD candidates) or early career researchers who have received a PhD no more than 5 years before March 2019. Parental leave or family leave are not included in this 5-year limitation. Past EPA winners are also eligible to submit their applications. All participants need to prepare their presentation for within a time slot of 15 minutes, which includes approximately 3 minutes for questions and discussion. The winner will receive a certificate from ESJ and a book awarded by Springer. The registration site will be available at early October. Deadline for ESJ membership application, and ESJ66 registration and application for oral presentations with EPA: 11:59 p.m. (JST) October 31, 2018. If you are not an ESJ member, please register to become one. See the official ESJ website. Deadline for abstract submissions: 11:59 p.m. (JST) February 13, 2019. Deadline for submitting presentation files: noon (JST) on the date of your presentation. A number of judges will be assigned to each session. All presentations will be judged and scored based on the quality of their research (50%) and quality of the presentation (50%). The best award and excellence award will be given to the first- and second-place finishers of each session. Only supporting information will be given on the EPA website (https://esj66epa-en.weebly.com/). Links to previous EPA websites (2014–2018) are also available. Please see the official ESJ66 website for detailed information on the EPA. If you are a student or postdoctoral fellow searching for a research job, you may display the Career Explorer (CE) Mark in your oral or poster presentation. Download the CE Mark file from The Japan Society of Applied Physics website and display it on the title page of your oral presentation or near your poster title. ESJ66 participants have permission to use the mark. Colorblind people can sometimes recognize a wide range of colors, though certain ranges of colors are hard to distinguish for them. Prevalence of colorblindness is fairly high: one in 12 Caucasian (8%), one in 20 Asian (5%) and one in 25 African (4%) males are red–green colorblind. Dr. Masataka Okabe (Jikei University School of Medicine, Japan) and Dr. Kei Ito (The University of Tokyo, The Institute of Molecular and Cellular Biosciences, Japan) have therefore promoted Color Universal Design. When preparing your presentations, please refer to the following website: http://jfly.iam.u-tokyo.ac.jp/color/. Invasive species continue to present new difficulties related to industry and human health. These problem are also having unexpected effects on human society. There is need to manage invasive species and their effects using scientific knowledge and realistic foresight, rather than ad hoc measures. For example, with knowledge that red imported fire ants have a huge negative impact on society and economy, there has been focus on this invasive species this year, bringing it notoriety. However, there are reports on success using effective management based on developed, defensive techniques against other invasive species. In Japan, the reports have been developed and increased in number on control techniques against invasive species. In addition to this productive research, recognition is increasing of the need to implement maintenance measures in the social system, and on citizens’ participatory activities. In this public lecture, we aim to present on the importance of basic research for management against invasive species, and to introduce the need to understand our social system and citizens’ participation and collaboration with efforts in this area. Please join us at the banquet at Kobe Portopia Hotel on Monday, March 18, 2019. Register and pay via the online registration system. Day-care and a family lounge will be available at the venue March 15–19, 2019. Details on available times and application procedures will be announced on the official ESJ66 website. ESJ66 will observe the Act for Eliminating Discrimination Against Persons with Disabilities. Please contact us via the inquiry form if you need certain accommodations to be made. Additionally, if you will be presenting your research, please try and contact us by October 31, 2018. A futsal (five-on-five soccer) tournament called ECOCUP 2019 is planned as a satellite program of ESJ66. This will be held on Wednesday, March 20, 2019 (day after the meeting’s closing day). Details will be posted on the official website. Participants must arrange their own accommodations. Although there are many accommodation options near Kobe’s central Sannomiya Station, the venue is located approximately 10 minutes by the Port Liner (Port Island Line) train from Sannomiya. Several hotels are nearby the venue, though they are quite high priced. Accommodations in central Kobe can be expected to be at capacity around the dates of ESJ66, so please book as soon as possible to be sure you can conveniently access the venue and find a place within your budget. The Organizing Committee of ESJ66 is always open to your opinions on the meeting. Please get in touch via the inquiry form.